I don't know about you, but I'm pretty done with pulling glasses from my dishwasher that look all cloudy and gross. When I go to the trouble to clean my dishes, I want that glass to glister like diamonds in the sun! Don't you? If cloudy glass is all I'm gonna get from store-bought electric dish soap, then forget it. That's how I came to making my own, folks. Then something happened while creating a homemade electric dish soap recipe: I learned a little-known secret about making a DIY recipe work. It has to do with chemistry (which I'm no wiz at, let me tell ya, but lucky for me, this is pretty basic). Now today's your lucky day, because I'm going to let you in my secret! Watch and learn, my friend. Watch and learn. See this glass? It just came straight from my dishwasher. Yep. Load after load, my glassware looks amazing! Purpose: Cleanser and water softener. 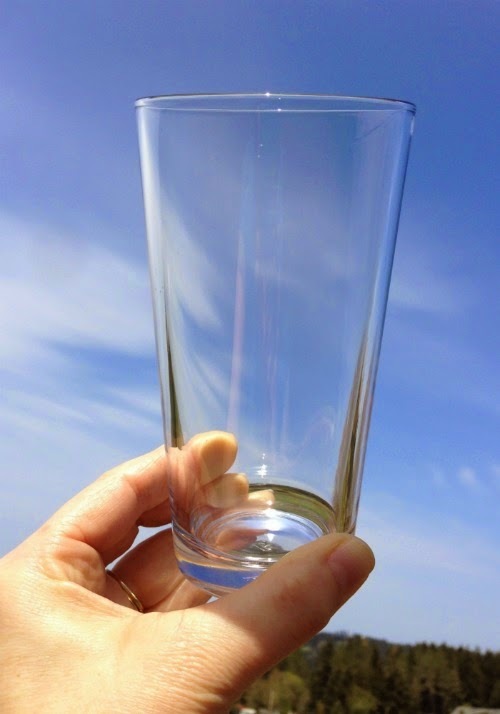 Soft water helps avoid the mineral deposits that can make glass appear cloudy. Washing soda is 50% more effective than salt, baking soda, or Borax when it comes cleaning power and water softening ability (so there's really no need to add these other things). What is it? Sodium carbonate is a PH regulator, as well as a food additive used as an acidity regulator, anti-caking agent, raising agent, and stabilizer. Purpose: Stain remover. Helps remove mineral stains and deposits, and hard water spots from glass and metal. Works to remove food stains from plastic cutting boards and other plastics. Purpose: Water softener. Helps eliminate mineral deposits and hard water build-up from your dishes. An antibacterial and antiseptic. Helps remove stains, such as coffee and tea. Is it safe? Two thumbs up! Purpose: Rinse aid. Helps remove residue (that white powdery stuff) from dishes. What is it? Acetic acid and water. A mild acid used for cooking, baking, medicinal, and cleaning purposes. What is it? All-natural, fragrant plant-based oil. Step 1: In a large (10 to 16 cup capacity) canister, combine 4 cups washing soda and 4 cups OxiClean (baby variety). Mix well. Cap with an air-tight lid and set aside. Step 2: In a separate large mixing bowl, mix the tangerine essential the citric acid with a fork until well blended. Place the scented citric acid in its own quart size mason jar or other air-tight canister. Do not mix the citric acid with the washing soda mix, as the citric acid will make the mix harden into a firm impossible-to-use lump, because it draws moisture to itself. Also, as I explain in a moment, it's important for the citric acid and washing soda to be kept separate during the cleaning cycles in your dishwasher in order to see clean dishes. 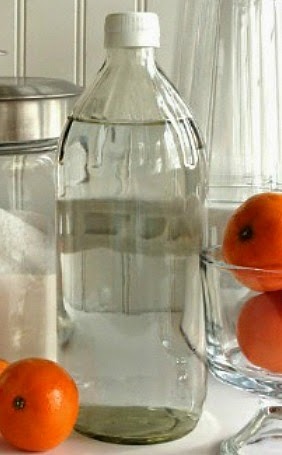 Step 3: Store the vinegar in it's own bottle. For convenience, keep a bottle near the other two containers dedicated for the purpose of using in your dishwasher. Do nothing to the vinegar. This recipe is so simple, you'll use it just like it is, plain. Did you know that if you mix washing soda and citric acid in water, they neutralize each other? That's because washing soda (sodium carbonate) is an alkaline base, while citric acid is acidic. You've probably seen before how baking soda and vinegar react when combined: The mix creates a fizzy, frothy explosion and when it's all over you're left with a flat neutral liquid. It's the same when citric acid and washing soda combine with water: It produces a similar kind of reaction. There's a bunch of fizzing as the two create carbon dioxide together, and when it's over, they're both neutralized. What does this mean for your dishes? It means that when combined in water inside your dishwasher, both the citric acid and the washing soda lose their poop and can't do they're cleaning jobs anymore. So here's the SECRET: You have to keep them separate. Let them do their jobs individually (Here I am thinking I'm so smart, and you probably already know this don't you)! Put 1 tablespoon of the washing soda / OxiClean mix in the smaller prewash reservoir. 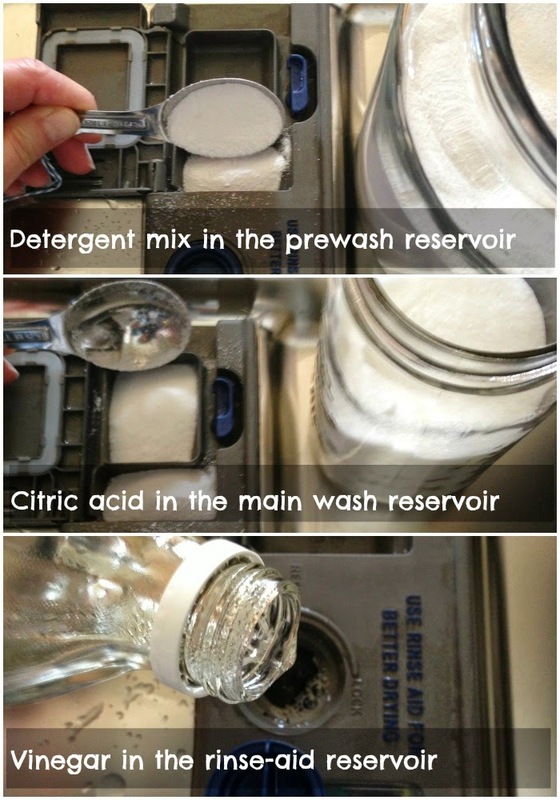 Put 1 tablespoon citric acid in the larger main wash reservoir. Fill the rinse-aid reservoir with the vinegar. You will only need to refill this every now and then when it runs low. Remove food and grease residue before loading dishes in the dishwasher. I keep a little scrubby sponge at my sink. I put a little soap on it and give each dish a quick scrub and rinse to remove dried on food or lip-stick before loading. Wash porcelain enamel by hand. 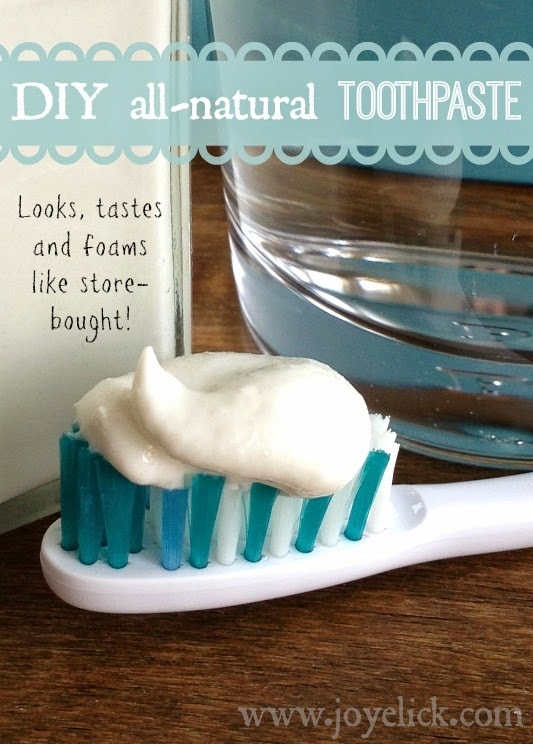 This recipe could cause some porcelain enamel finishes to oxidize and lose their luster. I've had mixed results with porcelain enamel, so I wash mine by hand just to be on the safe side. Always start with spot-free, unclouded glasses and dishes. If your glasses are already cloudy with mineral deposits, or covered in residue by some other detergent, don't expect this recipe to magically fix them. You should soak them in vinegar and scrub them with a non-abrasive scrubby to remove existing build-up first. Then you can put them through your dishwasher with this recipe and they should come out in as good of shape as they went in. Use a heated drying cycle, as this gets rid of water that could leave spots. (I like the heated dry option, but you may like how air dry works better. I've heard recommendations for both, so you'll have to decide which you prefer). 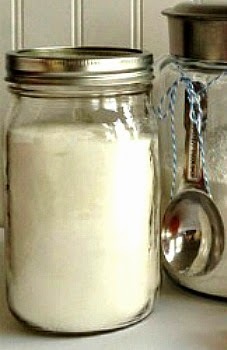 Don't you love that empowered feeling you get when you learn to make your own cleaning products that really work. 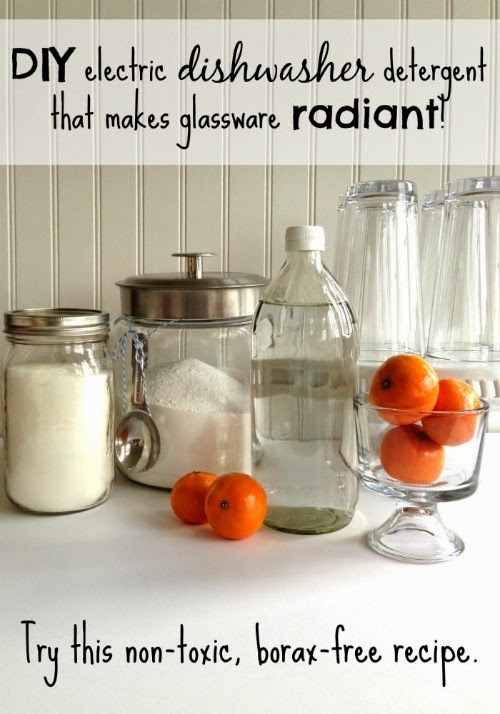 It feels awesome to pull gleaming glasses from my dishwasher now, knowing they're radiant all because of my homemade product (that works better than store-bought)! 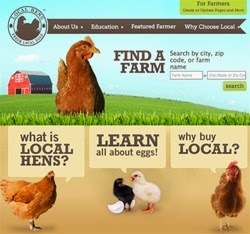 You should really try it! What're you still doing here? Go make some electric dish soap, silly! Hi Pamela! Thanks for your comment. I've been using this recipe for over a year now, and I'm very happy with it still. It really works well. Enjoy! Thank you for this post! I have been researching DIY dishwasher detergents all afternoon and no one explained what the ingredients they called for were intended to do or to keep the citric acid separate! I read post after post with comments complaining that the detergents either turned into solid masses of powder or that the glassware was covered in film, and no one gave any scientific answers or suggested storing and dispensing the citric acid separately! I have the ingredients for your recipe in my Amazon cart (except the oxiclean since I recently ordered sodium percarbonate to make laundry detergent) and can't wait to make it! Hi Beth! I'm so glad you found this post helpful :-) I still use this detergent every day and love it! Thanks for your comment. I've been using this detergent and method for the past month and have loved it! My dishes were so clear and sparkly. However, the past week or two I've noticed the glasses are covered in very noticeable spots and a bowl or two has had caked on food inside. Any tips? I always rinse dishes before they go in and can't think of why it would've changed. Thanks! Hi Beth. I'm not sure why the performance changed. Here are my suggestions: Try giving your dishes a good pre-wash with a soapy sponge and rinse before loading them. Also, do you use the vinegar in the rinse compartment? If not, this may help. What I know about DIY dishwasher detergents, is that things can vary depending on the hardness or softness of your water. Sometimes your water can leave mineral deposits on your dishes that leave spots. The vinegar rinse may help remove residue and mineral spots. Hope this helps. My dishwasher only has one compartment plus the rinse aid. How do you suggest I use this detergent? Hi Danielle. The best I can suggest in your case is to use only the washing soda and hydrogen peroxide powder in the one compartment. Don't use citric acid with it because, if not kept separate, it will cancel the cleaning power of the washing soda. Be sure to use vinegar in the rinse compartment, though. It will help achieve what the citric acid does: remove residue and mineral build up. I'll try it, thank you! My dishwasher is the same. The "prewash" compartment is called "the bottom of the dishwasher". However, try it without the citric acid first. I don't know why you'd need two acids to neutralize the soda anyway. Hi there. You don't need two acids to neutralize the soda. Neutralizing the soda is not the aim of the citric acid. The citric acid washes after the soda and helps remove residue left behind by the washing soda, as well as mineral build-up and hard water stains. Then, by the time the vinegar is on the scene, the soda and citric acid are gone. The vinegar acts as a final rinse aid. The citric acid is an important step, I think, to rinse the washing soda off well. I've tried these types of recipes without the citric acid and I've always gone back to commercial brands because of dissatisfaction with residue. I suggest opening the dishwasher up after it has been running awhile and adding the citric acid in. Also, if you have a plastic rinse aid resevoir vinegar will dissolve it over time, so I put a ramekin sitting upright in the top shelf and pour the vinegar in there and the splashing water takes care of slowly dispersing it. I read this tip somewhere else and can't take credit for that one. A lot of commercial detergents contain both soda and citric acid. They don't just neutralize each other. When combined they make sodium citrate, which is itself a cleanser. Many commercial products contain sodium citrate preformed. So saying that they simply cancel each other out is not quite true. Hi there. Thanks for your comment. You sound knowledgeable about chemistry. I am not a chemist. It's my understanding that the ratio between the citric acid and washing soda is important if you want your homemade dishwasher cleaner to work. A small amount of citric acid will not overcome and neutralize the washing soda. However, the ratio of citric acid to washing soda in this recipe does cause a reaction that diminishes the cleaning power of both components, so it really is best to keep them separate. Any thoughts on if I only have one compartment and a rinse aid compartment?? 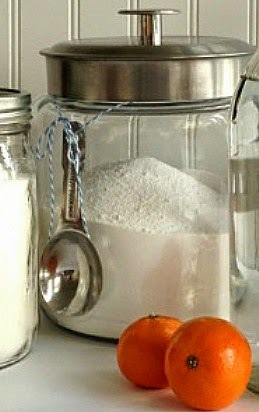 The homemade detergent has many advantages. Its security is proven. It does not contain the aggressive products that have a negative effect. Cleaning is one of the necessary thing obviously but how we should clean it depends, I really appreciate that you took time and described so well, I will make this detergent at home and will let you know its results.